Abstract: In terms of performance, the P4 2.4B still performed very well, and it should suit most peoples computing needs. Not everyone can afford top of the line processors like the Intel Pentium 4 2.8 GHz, but processors like the P4 2.4B are now clearly one of the best "value" Pentium 4's out there. Offering a good mix of price and performance, we'll be taking a look at whether this processor is "the one" to get.With a street price of around $330 CDN ($184 US) the P4 2.4B is not inexpensive, but when you compare that to the price of higher end P4's, $330 is actually quite a bargain . The P4 2.4B runs with a 533 MHz FSB (hence the 2.4B ) which gives the processor up to 4.2 GB/s worth of bandwidth. This is an increase from 1 GB/s of the older 400 MHz FSB Pentium 4 processors. The 2.4B features 55 million transistors which are etched on an enhanced, shrunken 0.13 micron Northwood Core. The unit we are testing is of the B0 stepping, runs with a default voltage of 1.5V and has a S-Spec of SL684. In terms of technology, the Pentium4 2.4B has all the technical goodies we have come to expect; including SSE2, Netburst architecture and Advanced Transfer Cache. 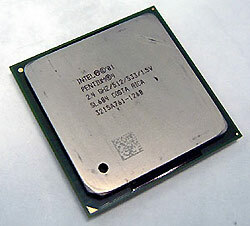 If you'd like to learn more on Pentium 4 architecture, please read our Pentium 4 1.5 GHz review. If you want to learn more on Northwood technology please read our P4 1.6A review. As the 2.4 GHz Pentium 4 is based on an earlier B0 stepping, we weren't too sure how well it would overclock. I began to up the FSB slowly and at the 150 MHz FSB mark it started to show some stability problems. Increasing the voltage to 1.6V stabilized things. After increasing the FSB to 160 MHz, the processor again started to show some stability problems and we had to set Vcore to 1.65V. No matter what voltage we gave the processor, the chip just wouldn't go any higher than 163 MHz FSB. We used an Antec 300W PSU in this review so it's possible that the limiting factor may be the powersupply. In the end we settled for a 163 MHz FSB, which gave us 2.93 GHz overclock. Not bad for a "budget chip."